Since Chris Moneymaker won the World Series Of Poker back in 2003, poker has become gigantic. TV advertisements for a plethora of poker websites, monthly poker magazines, hundreds of books detailing strategies and correct play techniques and of course, video games. Poker is all about reading your opponent from their expressions and how they have played in the game so far, using that knowledge the great players can predict how strong their opponent’s hand is at the right moment. This is the difference between a good poker player and a great poker player. That being said, AI in poker games has to be on the level as a fantastic FPS, or better. This is where poker video games usually fold. The majority of them can’t replicate the feel, excitement and adrenaline that playing online poker can. But when they do, they are something very special indeed. Governor of Poker takes the poker game and tries something new. 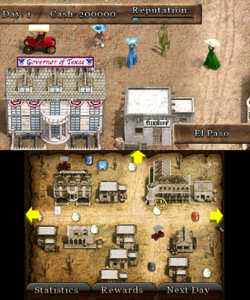 The story mode sees you trying to earn enough money to buy all the property in every town in Texas. Once you own all the houses and saloons, you take on the best player in town for a horse. 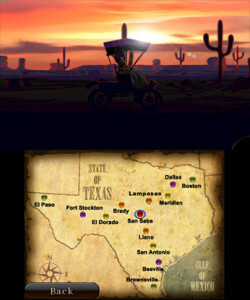 Win this and you can ride the horse to the next town and repeat this process. The story is basic and very repetitive. That’s not a bad thing in this case though, this is a poker game after all. If the story was more in depth and got in the way of the poker, then this wouldn’t really be a poker game. You know the NPC’s at the poker table in Watch Dogs or Red Dead Redemption? This is basically their story. They sit and they play poker. Simple. Now, let’s get to how the poker plays. With the game being set in Texas, I’m sure I don’t need to tell you what poker variant this game houses…. It’s Texas hold em…. In the 1st town you play 8 seated tournaments, top 3 win money, very simple. The further you get, the more people there is to beat per tournament. The poker itself plays well. All characters are AI so its a plus that the game move at a fast when the action isn’t on so you’re not waiting for the AI to make a decision for minutes at a time. The blind levels go up after every 4 hands to make sure the games don’t run for too long. When a player loses a hand in a bad way they will sometimes go on tilt, you can see this on screen as smoke will bellow out of their ears. This is a great indication that they are probably going to make a mistake in the next few hands because of the anger from losing the prior hand so unfortunately. All this shapes for a fun game that is accessible to a larger crowd than just traditional poker players. Most of the options you see on your preferred poker site make their way to this game. The obvious call, check, bet and raise functionality, along with showing a bluff, mucking a lost hand, you can even stake one of your properties if the going gets tough. Along with tournament play, there’s also cash games that can be entered. Here you are betting your hard earned money and sometimes houses, so be careful against the better players in the higher stakes saloons. 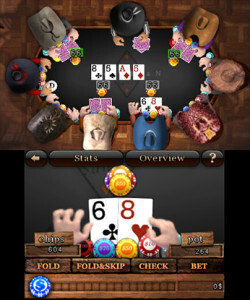 Once a player busts out in these games, no one comes to take their seat, so you will have to quit and re-enter to get back to a full table. If it comes down to it and you have lost a huge chunk of your fortune, you can sell a property to raise the funds to enter a tournament. You will need to buy it back however to continue onto the next town. There isn’t a standard tournament entry fee, as it will keep fluctuating day to day in the game. This is a slight annoyance as it makes it harder to budget your funds. You may think you have enough for another game, but for no reason at all the buy in has gone up and you need to sell a house to enter the tournament. The AI have voices and call out their actions. Unfortunately, there are 2 male and 2 female voices so you hear the same disappointing “fold” or anxious “raise” shout about 40 times per game. This made me want to play with the sound off for large chunks of the game. To raise your bet, there is a slider at the bottom of the touchscreen that you slide up and down to get to your desired amount. Getting the correct amount can be tricky though as the difference between $2 and $4 is about 2 millimetre meaning you need the precision of a surgeon to bet the correct amount. The 3D effect on this game is fantastic. You get a top down view of the table with everyone’s hats protruding through the screen. You also win awards for achieving certain things in a game, like knocking someone out, or beating a 3 of a kind. This adds a sense of achievement to the game, even if you are getting pummeled. There is a stat chart in game too, which can make it easy to see how likely an opponent is to bet, raise or fold at any given moment. With a basic story and above average poker mechanics, the game does very well, but is let down by the finicky bet slider meaning you can rarely bet what you want too. The absence of multiplayer (online or otherwise) also hurts the longevity of the title. It’s a bold statement to call yourself the governor of poker, this game is more like the dutchess.